The worst thing about snow- when it melts. A lot of that today around here. Tonight it's more of the same- rain or freezing rain. This next wave is going to be a matter of not temperature degrees, but degrees of latitude. Here are the GFS maps for Monday, since it did the best job last week with the snow on the 5th. Where does the front set up? On the left is the surface map and 12 hour precipitation. 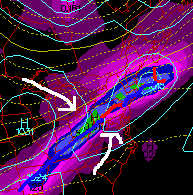 On the right is the 850mb temperature map. This level is roughly 1500m or 4,500 ft above the ground - but changes all of the time. This level helps us with ice events as well as expected temperature down at ground level. You can see I've circled the 10C in yellow, which would put us in the 60s, but the 0C in light blue is in northern PA. A sharp contrast in a close area. I still expect rain, but there will be a range of temps close to 40F or 60F depending on how far north the front can get. The atmospheric tendency has been to verify a little farther south that model predictions. 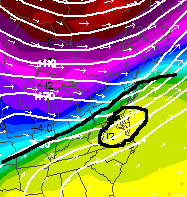 That would eliminate the the GFS aiming for 60F on Monday. Although I would feel safe in the low 50s. The one caveat, if we get sun after morning rain, or the wave in OH gets stronger. That would lift the front north and would increase our likelihood of jumping on the heat bandwagon. I'm taking the rest of the weekend to watch my snow melt. It may be another two weeks until we can get more.